Laptops and tablets are hard and breakable; many can’t handle harsh conditions. And bending or stretching them is out of the question. But what if you could fold up that tablet and stick it in your pocket? 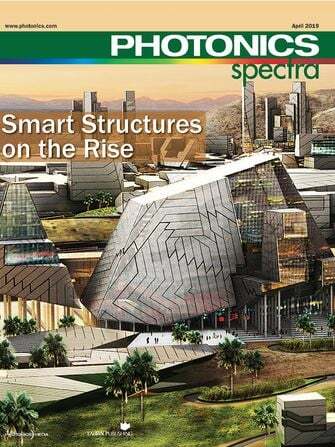 Or imagine an ultrathin smart tablet that can easily be stretched from small to extra large. This is a potential application of stretchable smart fabric that has been developed in a lab at Michigan State University. Chuan Wang, assistant professor of electrical and computer engineering, said the material can be produced on a standard printer — promising major cost advantages over current technologies. 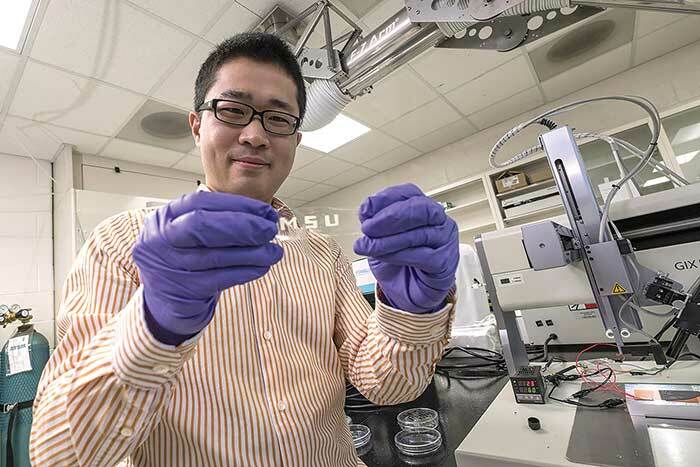 Chuan Wang, a Michigan State University engineering researcher, displays the stretchable electronic material he and colleagues developed in his lab. Courtesy of Michigan State University. Professor Wang and his team have developed the first stretchable integrated circuit that is made entirely using an inkjet printer. The smart fabric is made from nanomaterials and organic compounds that are dissolved in a solution to produce different electronic inks. The inks are run through the printer to make the devices. The smart fabric created by Michigan State University engineers, shown here in its stretched state, could one day lead to an ultrathin smart tablet that could be manually stretched to a larger size. Courtesy of Michigan State University. Researcher Le Cai told Photonics Media that, from the ink, they have successfully created the elastic material, the circuit and the organic light-emitting diode (OLED) needed for such a technology. This new technology is suitable for low-cost and large-area manufacturing without using expensive cleanroom facilities, which complies with the idea of green manufacturing. Their next step is combining the circuit and OLED into a single pixel, which they estimate will take one to two years, as there are generally millions of pixels just underneath the screen of a smart tablet or a large display. Once this is accomplished, the smart fabric can be commercialized. The stretchable electronic fabric can be folded and then put in one’s pocket without breaking. But, there are other potential applications. “Ultimately, we are shooting for large-area, conformal and interactive systems composed of electronic circuits, display and lighting elements, sensors, actuators and energy harvesting components,” said Cai. Ink-fabricated stretchable circuitry smart fabric — say that three times fast — could change the look and feel of tomorrow’s electronics.